The mojito is my favorite cocktail. 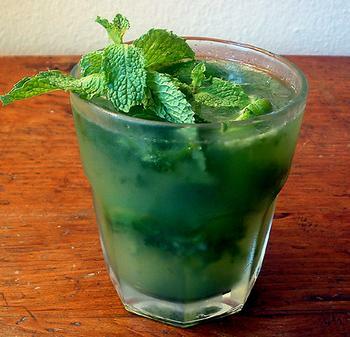 Rum, mint, lime, and sugar combine to make an incredibly delicious and thirst-quenching drink. According to the legend told by the late Angel Martinez, the origins of the mojito derive from a drink made of sugar cane-sweetened water spiked with unrefined rum that was consumed by slaves in Cuba in the late 19th century. By the early 20th century, the story goes, the mojito came into its own in Cuba as a popular drink at the Playa de Marianao, a working-class beach in a borough of Havana. 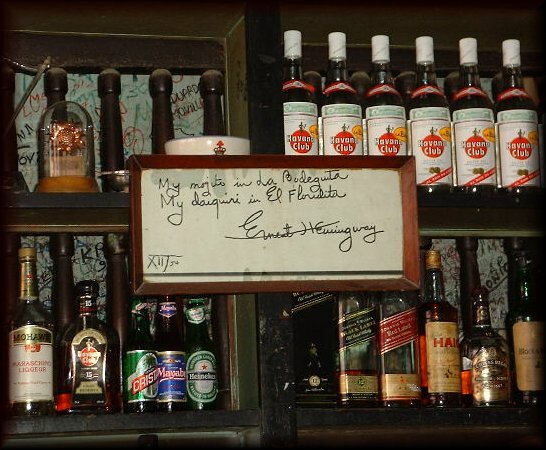 International acclaim for the cocktail emerged after 1946, the year that Mr. Martinez opened La Bodeguita del Medio in Havana and started to serve mojitos endorsed by Ernest Hemingway, attracting the likes of Brigitte Bardot, Pablo Neruda, Nat King Cole, and Errol Flynn, among others. 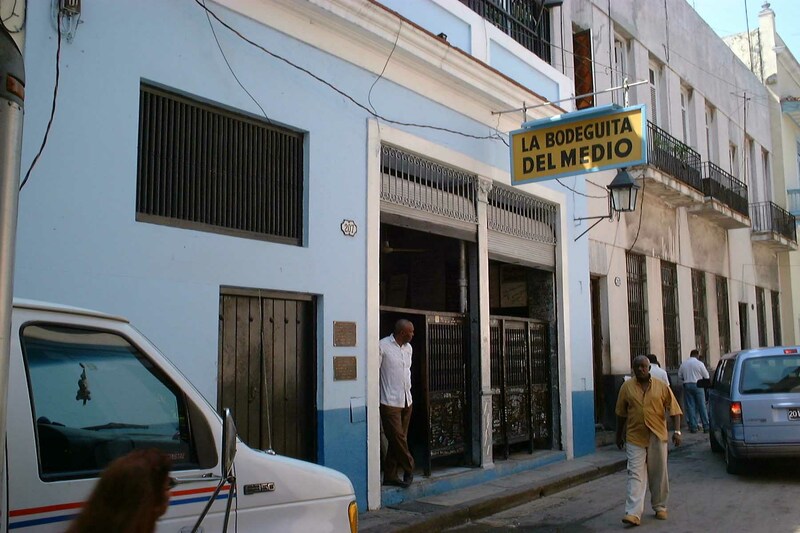 Today, La Bodeguita is a major tourist destination (tourist trap, according to this article), that has even spawned a copycat in Palo Alto, California. I like to make a mojito by muddling a substantial amount of mint leaves (5 to 10, depending on their size, though I don't think I've ever used too much mint) with two teaspoons of sugar (a mortar and pestle will also work for this step). The important thing is to grind the sugar into leaves so that the granules are completely incorporated and dissolved within the mint and its juice. This will form a sort of paste of mint and sugar. Combine with the juice of one lime and the leftover lime, cut into quarters. Add two ounces of white rum. I like to use Marti Autentico Licor de Ron, a Cuban-style white rum that is flavored with lime and mint. Add club soda, crushed ice, and shake in a cocktail shaker. Garnish with a sprig of lime. The “faux-jito”: When my wife wants to skip the alcohol, I combine all of the above ingredients except for the rum to make this mock version of the original drink. I am in complete agreement. The Mojito is not only a fantastically refreshing cocktail, it is also one hell of a way to hide loads of liquor in a seemingly innocuous little drink. Be careful drinking these little guys, because one goes a long way. I hold the mojito completely responsible for the failure of my last relationship... and the birth of my current one. Viva the mojito! I recently made a mojito with dark lamb's navy rum and it is amazing...2 tbsp sugar, squeeze lime(then put into shaker), 6-8 fresh mint leaves, rum and ice in shaker and shake vigourously to extract mint flavour. Pour into coloured martini glass edged with sugar. Wow. The colour is not as nice as traditional but the flavour more than makes up for it. Nice hosting! It’s my first time to read like this article. Great Site, your plugins are very useful and save me a tonne of time. This is a wonderful site! I’ve been looking for something like this for a while now! Thank you!